Williamson grew rapidly once the railroad connected into the town. Its population, just 688 in 1900, jumped to 6,819 in 1920 and 9,410 in 1930. Williamson is the site of a large rail yard built by the former Norfolk and Western Railroad (now Norfolk Southern Railway), which was built to service the many coal mines of the region. The city is protected by a floodwall, completed by the U.S. Army Corps of Engineers in 1991 in response to a devastating flood along the Tug Fork River in 1977. Today an interesting stop to make in Williamson is the "Coal House". The Coal House located in the courthouse square in downtown Williamson, West Virginia, stands a fitting tribute to the abundant mineral that has brought prosperity to the entire Southern section of West Virginia. It was built in 1933 as a result of an idea by O.W. Evans, then manager of the Norfolk and Western Railways Fuel Department in Williamson. He hit upon the novel Coal House idea, and gained civic support for the project. Materials, labor, and cash were donated by local firms and individuals, and the one-story building was designed by H.T. Hicks, architect, of Welch, West Virginia. The 65 tons of coal were cut into blocks that were used in the four walls and the two smooth pilasters at the front of the building. The general appearance of the structure is that of cut stone, although, of course, black. Foundations are masonary set on concrete footings. The outside surfaces are remarkably in tact, thanks to coats of weatherproof varnish applied every two years which protect the building from deterioration by weather. 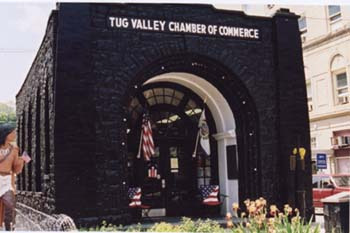 Although it is thought that nobody ever actually lived in the Coal House, it now houses the Tug Valley Chamber of Commerce.